History: J.S. condition started June 2016 secondary to fall. Xray was done and revealed Lisfranc Fracture of the Right Foot.. Foot was in a cast till November 2016 ; X-ray was done and revealed full healing of the fracture. Patient used cane to support walking until June 2017. Chief Complaint: Tenderness on the ® dorsal and plantar forefoot area ; Foot aches. Goal: To be able to dance on her daughter’s wedding without pain. Treatments: Patient started Laser Therapy treatments at ALRC on August 31, 2017. Patient felt gradual improvements over the weeks of treatment. Patient able to to dance during her daughter’s wedding without any discomfort. 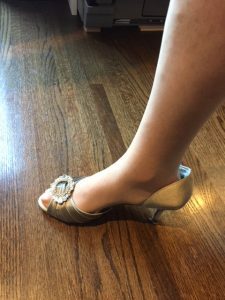 These are the few words from J.S.“It exceeded my expectation, I stood up for 5 hours during the wedding ceremony and danced on my wedge shoes from 5pm till 1:00 in the morning” -J.S. Patient was advised to have a follow-up treatment after a month from discharged date (October 29th, 2017). One of the two lovely pairs of shoes that J.S. wore during her daughter’s wedding. Happy Foot.. Happy Dancing!!! Lisfranc injuries, also called Lisfranc fracture-dislocations, are the most common type of dislocation involving the foot and correspond to the dislocation of the articulation of the tarsus with the metatarsal bases. Untreated Lisfranc fractures lead to post-traumatic arthritis and compartment syndrome, in which swelling builds up pressure in the tissues of the foot and causes damage to the nerves, blood vessels and muscles. Cold laser therapy, or Photobiomodulation Therapy, typically for the treatment of chronic pain or to promote healing. This type of therapy, aims within the painful area. The idea is to bombard the area with photons that are absorbed by the cells, which then go into a healing mode. The treatment may also increase blood flow to the area, which can stimulate healing. Cold therapy can be used for such foot problems as ligament strains, Achilles tendinitis, heel spurs, and plantar fasciitis.